In the last decades of the 19th century the Nassau-Fulton Street area, the center of the Manhattan jewelry district, was undergoing extensive change. Small commercial buildings were quickly giving way to impressive multistory structures as new construction technology allowed for taller buildings. In 1888 the four-year old architectural firm of De Lemos & Cordes had designed the striking brick and terra cotta No. 90 Nassau Street at the corner of Fulton. Three years later they would be back to design its neighbor across the street at No. 130 Fulton Street. Theodore W. E. De Lemos and August W. Cordes had been busy in the interim, working on Nos. 27 and 29 Pine Street for Kuhn, Loeb & Company; the Eden Musee and Arion Hall. Before long they would be well-known for their monumental department stores like Siegel-Cooper on 6th Avenue’s Ladies’ Mile and Macy’s Herald Square. Begun in 1891 and completed two years later, the Renaissance Revival-style Fulton Building gently wrapped the corner. Four stories of rusticated limestone formed the substantial base. Above, tan brick was richly decorated with terra cotta. A balcony at the fourth floor followed the curved façade which required the added expense of custom-made bowed glass for the widows. The building filled quickly with a mix of legal offices and jewelry firms. Among the first were lawyers Siefel & Lauer; Henry Muller, importer of diamonds; and attorney Julius Lipman. Lipman’s office would be the scene of a near-riot in September 1893. The attorney had been put in charge of an estate with property at Madison Avenue and 116th Street and hired contractor Joseph Dunn to do some work. When Dunn presented Lipman with a bill, the lawyer refused to pay the full amount, citing less-than-satisfactory work. Without the full payment, Dunn was unable to pay his Italian workers. When the immigrant laborers demanded their money, Dunn instructed them to take the matter up with Julius Lipman. While jewelry firms like Mabie, Todd and Bard, sellers of pen cases and pencil point protectors, moved in in 1897, another group of merchants was establishing itself in the area—rare stamp traders. One of these was Walter S. Scott who had already opened his shop in the building. Scott’s father ran a similar stamp shop just around the corner. Among Walter Scott’s steady customers that year were two young teenagers, Henry Cunningham and Harry Chase—neither yet 15 years old but both very knowledgeable in rare stamps. What the dealer did not realize was that the boys—whom The Sun labeled “precocious youngsters”—had more than stamp collecting on their minds. They were adept thieves. Cunningham and Chase would innocently walk into the stamp shops and ask to look at particularly-valuable stamps which were customarily displayed in books. When the proprietor turned away, they would carefully remove the stamp and replace it with an ordinary stamp to hide the theft. For a few months during the winter of 1893 they had been successfully executing their ploy, netting themselves between $300 and $400—about $10,000 today. Ironically, they often unwittingly took stamps stolen from Scott around the corner to sell to his father. In 1898 The Independent Magazine set up its offices in the building and would stay for two decades. The popular periodical was founded in 1848 and provided political and social insights. The unscrupulous actions of one tenant in the Fulton Building nearly ended in tragedy in the fall of 1900. Attorney Bonford Boniface lived with his mother at No. 144 East 58th Street when he met the beautiful Adelle Cram of Greenfield, Massachusetts in Central Park. The young woman, whose parents had both died, came to New York in October of that year to find work. Boniface swept the girl off her feet and soon promised to marry her. He simply forgot to mention his real name. Now trapped in his own deceit, Boniface tried to squirm out of his own trap. He sent a letter to Adelle saying that he was to undergo an operation; “and then a friend wrote that he had died,” reported The Evening World. It was too much for Adelle to bear. Before any wedding would take place Adelle had to face charges of attempted suicide. Jewelry firms continued to rent space in the building, but by now the tenant list was more mixed. The Guarantee Investment Company was here as were the attorney offices of J. P. Solomon and Oscar Aronson. Architect R. L. Daus operated from the building for at least a decade and in 1906 Morgon Manufacturing Company had its headquarters here. The firm produced “water faucet motors,” a clever device that attached to any faucet, using the water flow to power a small machine for polishing, grinding or sharpening. Called the National Secret Service Information Bureau, the organization insisted on working independently of organized law enforcement. “The new organization will do its work all alone. It will not seek the aid of Commissioner Bingham’s Italian detectives. It will have its own private detective system when trailing Black Hand suspects,” reported The New York Tribune. There continued to be several legal firms in the building at the time, including Frank W. Jackson; German-born Frank von Briesen, a well-known patent attorney; and Milton Frank. It was perhaps a good thing for the jewelry tenants because they were consistently finding themselves in legal trouble. In July 1914 diamond dealers Herman J. Dietz and his son, Charles were indicted in a diamond smuggling plot which the Federal Grand Jury alleged involved bringing up to $1 million in gems across the Canadian border. The pair reportedly traveled to Canada twice a month, rarely together, returning on night trains and secreting diamonds in their baggage. The men also paid a Canadian named Wood $100 per trip to smuggle diamonds to their office. By bypassing Customs the dealers saved 20 percent duty. As if they were not in enough trouble, at the same time they also conspired with Oscar Kockeses, a jeweler on Maiden Lane who was on the road to bankruptcy. When the brothers helped him to conceal assets from his creditors it landed them in the Atlanta Penitentiary in June of that year. Abraham Stark ran his jewelry shop on the fourth floor here in 1921 and he found an inexpensive way to get valuable jewelry. He made a deal with Elwood Adams, a jewel thief. Adams, also known as Cox, would be charged with jewel thefts totaling $50,000, at least $10,000 of which ended up in the showcases of Stark. Some of the loot was snatched by Jean Cunningham, a maid in the home of Lawrence Craufourd at No. 125 East 56th Street. The women managed to sneak out $5,000 in jewelry before being caught. 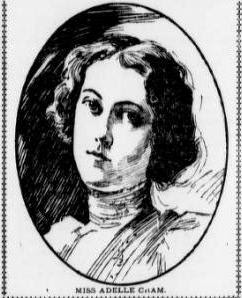 The maid talked, resulting in Adams’s arrest and his accompanying detectives to Stark’s shop in the Fulton Building where the stolen jewelry was found. Among the jewelers who did not go to jail through the 1920s and ‘30s were diamond merchant Ely W. Harwood; H. M. Manheim & Co. who advertised a wide array of goods including “diamonds, watches, jewelry, silverware, ivory pyralin good, etc. ;” Leopold Strasser and John Weiner. In fact, Wiener, a diamond cutter, was the victim of theft when on May 15, 1920 a $5,000 necklace disappeared from his shop. Two years later on June 3, 1922 a salesman from the firm of Barzilay & Der Linden appeared at Wiener’s door with jewelry offered for sale. Among the items was Wiener’s own necklace. Wiener seized the necklace, resulting in a larceny charge which he won in court. Undaunted, Barzilay & Der Linden obtained another summons and Wiener was forced to re-appear in court. He won that case too. 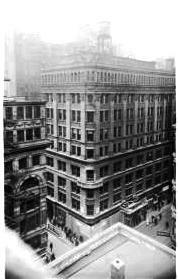 The Fulton Building continued to house stamp dealers, jewelry firms throughout the 20th century. Then, as the downtown area became as attractive for residential as for business purposes, the building was converted to coops under the direction of head architect Elliot Vilkas in 2005. A nondescript four-story addition was plopped onto the roof that succeeded in destroying the proportions of the building and adding nothing other than 20 more income-producing apartments.